For your next event, use these versatile glasses as shot glasses, votive candle holders or fill them with lovely treats. Made from solid glass with a thick base, these glasses will make a perfect addition to your event tables. Serve up exotic shots, create an ambiance when you light up tealight candles and offer your guests small trinkets or hand-made treats. To add extra pizazz, personalize the glasses with your own monogram. Use our special new online Design Previewer Tool and build your own design to match your event's theme. Select from our huge range of monogram designs and style types. We will screen print your final image directly onto the glasses. 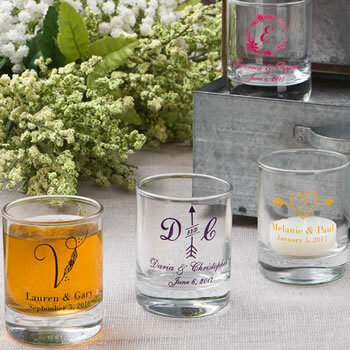 Your guests are sure to keep these little glasses as a memento of your special event. A unique and meaningful favor for weddings, anniversaries, birthdays, bachelor parties and other grand occasions! Wonderful! The shot glasses were exactly as expected. Thank you so much. I ordered 60 shot glasses/votives for my baby shower. One broke during shipping, but I had accounted for that and ordered an extra to be safe. I shopped around before ordering from here and they were by far the most affordable and the glasses were beautiful! Nicely done and shipped. Pretty large for a shot glass but it will still work as such. Perfect for a votive. My order was shipped quick as well as it was packaged nicely. No glass ware was broken. However, I did receive one blank shot glass. The rest were done neatly... The design was just very thin. Although it was black it was hard to see. Other than that the shot glasses were a hit and we are mostly satisfied. I received my order in a very timely fashion and it turned out great. Out of 135 shot glasses ordered only 3 broke during the shipment and I was refunded the amount for the broken glasses within 2 days. My advice, order 3-5 more than you need just in case any break during shipping. I am using these as party favors for my wedding at the end of September and can't wait to give them to my guests. These are perfect for our daughter's wedding reception. The packaging was good and they arrived on time. Just the right size for a votive candle. I love these votives / shot glasses! exactly what I wanted and the color is great. I loved these shot glasses from the moment I saw them! They are perfect for our guests! They didn't take very long to ship and they were exactly as i expected! I can't wait till I get to give these out! Thank you so much! They turned out very nice. The price was great too. I received my glasses on time and all of them were in one piece! I filled them with Hershey Kisses and they looked awesome at my guests place settings! Thank you! With this being my first time using Nice Price, you definitely lived up to your name. The product is what I designed, the quality is great and, the price...nice! My only "ping" is that I had hoped for a color (burgundy) that you didn't provide (having a football party for my husband, who is a Washington Redskins fan). I'm adding burgundy candles to create the team colors. Thank you, Nice Price. I was satisfied with the shot glasses. They were as described.